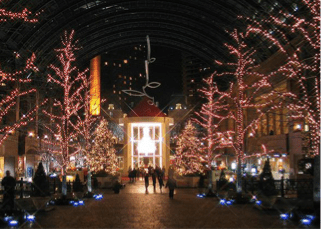 Christmas is popular in Japan even though many citizens do not celebrate the religious aspects of the holiday. Christmas markets are popular in Germany where different kinds of food and decorations are sold. The most popular are the glass ornaments. When walking into Walmart one day I had to stop and look around for a moment. Christmas trees had been put up complete with decorations. During a lull in the mass chaos of children screaming and adults talking one could hear the faint singing of “Rockin’ Around the Christmas Tree,” or “Santa Claus is Coming to Town.” Even though Christmas is still a few weeks away everyone is starting to get into the holiday spirit. Christmas is celebrated differently around the world. For some there may be a religious belief behind it and for others it may just be a time to spend with family members. Let’s take a look at how some other countries celebrate Christmas. Japan does celebrate Christ- mas, however most of them don’t believe in Christ. They will still decorate their homes and stores for the holiday. do believe in Christ,” said Sachiko Takuechi, a student from Japan who is currently studying at Seton Hill University. In America, the Christmas holiday is spent with family and following traditions such as baking cookies and looking for Santa Claus. In Japan, New Year’s Day is spent with family. Christmas Day is spent differently. Christmas is also known for its variety of foods along with cookies and other desserts. “Our Christmas meal is Kentucky Fried Chicken, Christmas cake and chanmery, which is a wine,” said Takuechi. Many stores in America will be closed on Christmas Day so that workers can spend time with their families. Stores in Japan are open on Christmas. In Slovakia, Christmas Eve is the most important day during Christ- mas. It is called ‘Stedry den’ which means The Generous Day. Christmas Trees are put up and decorated with homemade deco- rations made out of wood, baked goods made with honey and other sweets. The trees are kept until the Feast of the Three Kings, which is celebrated on January 6. The children are then permitted to eat the sweets off the tree. The main Christmas meal is known as “velija” which consists of 12 dishes. Some of the dishes are a baked ham or goose, bobalky, potato salad and ‘Kapustnica.’ ‘Kapustnica is a thick cabbage soup with sausage, meat, dried mushrooms and cream. Apricot cookies are a favorite for this time of year. In Germany, a big part of the Christmas celebrations is Advent. An advent calendar made out of a wreath of Fir tree branches with 24 boxes or hanging from it is popular in the homes. Each box or bag has a small gift inside. Christmas trees are very important and were first used during the Middle Ages. Traditionally the tree was brought into the home on Christmas Eve. During the evening the family would read the Bible and sing Christmas songs. Some of the popular ones include O Tannebaum, Ihr Kinder lein Kommet and Stille Nacht (Silent Night). 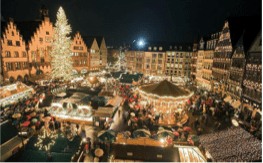 Christmas markets are well known in Germany. Different kinds of Christ- mas foods and decorations are sold at these markets. The most famous ornaments are the glass ornaments, which are hand blown. One tradition in Germany is to hide a pickle on a Christmas tree. The child who found the pickle would get an extra present. In America, many families have different traditions for Christmas Eve and Christmas Day. Most importantly, Christmas is a time to spend with one’s family and close friends. Spread some butter inside of an 8-inch round cake pan. Put eggs and sugar in a bowl and whisk very well. Place the bowl over hot water in another large bowl and whisk further. When the egg mixture becomes white, shift flour and baking powder together and add to the bowl. Add melted butter in the bowl and mix gently. Preheat the oven to 350F.Pour the batter in the pan and bake in the preheated oven for 25-35 min. Remove the cake from the pan and cool it on a rack.